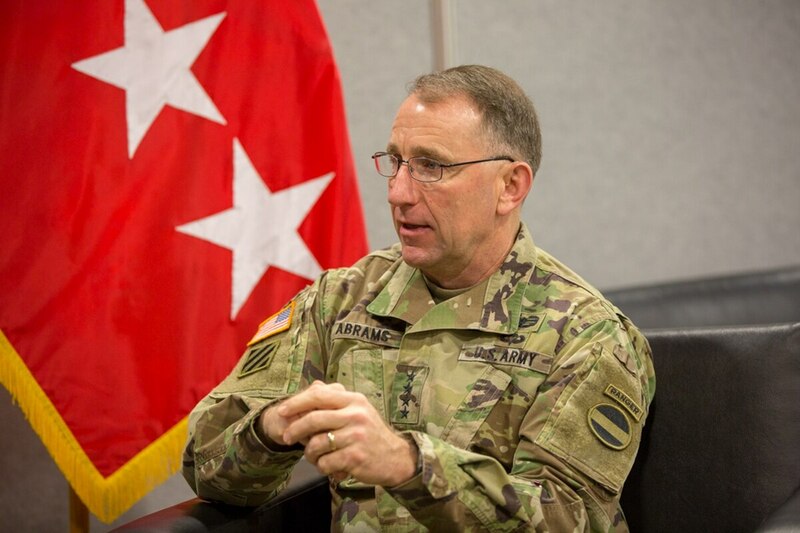 HUNTSVILLE, Ala. — The U.S. Army’s relatively new concept for testing possible capability for the force — the Joint Warfighting Assessment — will be embedded in existing exercises rather than be a stand-alone event, Gen. Robert Abrams, the service’s Forces Command leader, told Defense News in an interview at the Association of the U.S. Army Global Force Symposium on March 27. Originally dubbed the Army Warfighting Assessment, or AWA, the construct replaced one of the two Network Integration Evaluations held at Fort Bliss, Texas, each year. The first official AWA was held in October 2016. As the Army expanded the AWAs to include joint and international partner elements, it renamed the event the Joint Warfighting Assessment, or JWA, and will hold its first event in Europe, where the Army is heavily engaged. Taking it even further, the JWA will combine its exercise with the the U.S. Air Force Europe’s Blue Flag exercise as well as U.S. Army Europe’s Combined Resolve X from April 20 through May 9 at Grafenwoehr and Hohenfels, Germany. And that is the way it will be going forward. “Starting this year, we are actually going to leverage existing exercises for JWAs, so we can think about the future and how we might fight in the future,” Abrams said. Network Integration Evaluations have also fallen by the wayside in favor of evaluating Army capability operationally by injecting it into smaller, more frequent exercises around the world and at training centers.